Too much red tape can hold back a team member, a project, even a whole organization. If you’re frustrated by the so-called red tape in your organization and are looking for ways to clear the path to efficient productivity, Jennifer Bridges, PMP, has got the answers. Red tape as a term is often used to describe the slow and convoluted process of business administration. Jennifer noted that it comes from industries that are regulated, and for good reason, though sometimes the process is outdated. When people complain about red tape, they’re really saying that whatever regulations or processes required by a company are yielding negative results. Fortunately, there are ways to create a more efficient process by decreasing the number of sign-offs when possible by establishing metrics, thresholds and using tools. Jennifer said there is good and bad red tape. Bad red tape is when there is too much bureaucratic process that bogs things down, while good red tape offers checks and balances, as well as a second set of eyes to make sure everything has been done properly. The cons in red tape can lead to missed opportunities, a loss of team interest and overall frustration. The pros to red tape can lead to better working products and services, compliance and reduced risks. Red tape isn’t inherently bad, but it can be used poorly. When trying to eliminate red tape, the goal is really to remove the cons and add to the pros. This can be by first looking over the process you’re using and deciding on which side of the scale you’re more heavily leaning. Then, it’s a matter of balance. For example, maybe you’re having too many sign-offs involved in the process, and you can cut some slack there. Or perhaps having metrics and thresholds will more efficiently clear the path without giving up quality. And there are always tools that can be implemented to become more efficient. Pro-Tip: If process is getting in the way of your productivity, there are ways to cut the red tape. First, remove everything that doesn’t add value. You can also delegate and empower your team to take on more responsibilities. 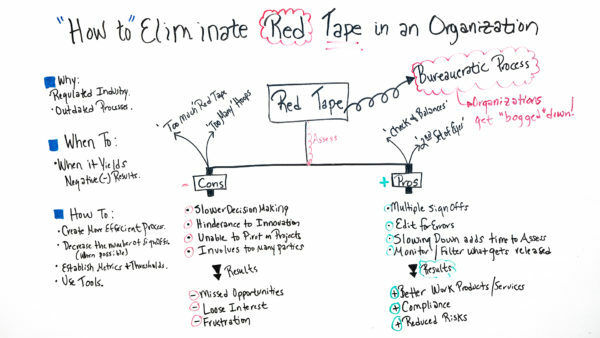 Today we’re talking about how to eliminate red tape in an organization. But before we do that, I wanna talk about red tape. Why do we have it and where does it come from? Well, in today’s time, there are certain industries that are highly regulated. Therefore, red tape. And I would submit, there are some organizations that their processes are highly outdated. But before we talk about when to eliminate it and how to eliminate it, I wanna first talk a little bit more about red tape and what it is. It’s a bureaucratic process and it bogs organizations down. One thing we wanna do though, is assist the red tape, because we wanna determine the pros and the cons. We wanna talk about good red tape and bad red tape. Well, so let’s first talk about assessing. Let’s talk about some of the cons. Well, some of the cons are it provokes slower decision making. It’s hindrance to innovation because of bogging things down. Unable to pivot on certain projects because of so much red tape it just can’t happen very quickly. It involves too many parties to decide what to do and getting those sign-offs. So the results are, many times, missed opportunities, the teams or organizations, the people involved lose interest and there’s a lot of frustration. So, that’s what happens with too much red tape and too many hoops to jump through. So let’s talk about the pros, though. There are some good red tape that often organizations implement. For instance, multiple sign-offs. By having multiple sign-offs, sets a check and balance to ensure things aren’t dropped and illegal things done. Also, when you have checks and balances and a second set of eyes, it allows for editing for errors, making sure there are no gaps or things that are missed. And by slowing down, it adds on time and gives you more time to assess what’s going on. Also, it allows you to slow down to monitor and filter what gets released, whether it’s a press release, whether it’s data that’s released, but whatever release gives you time to make sure that’s what you want going out. So, the results are better work products or better services, tighter compliance to things that maybe you’re regulated on in your industry, and reduced risk. So, by looking, determining if it’s good or bad red tape, you can determine when to eliminate it. Well, when it yields negative results, we wanna eliminate that red tape. Well, how do we do that? Well, first of all, we create more efficient processes. So with those efficient processes we get to determine if the number of sign-offs are accurate. Maybe we don’t need so many people signing off anymore. Also, we wanna establish metrics and thresholds. If we implement certain thresholds, maybe that’s when we get other people to sign off or monitor or edit things. And use also tools to help. So if you need some tools and other methods and best practices to help you eliminate red tape in your organization, then sign up for our software now at ProjectManager.com.